In general, I try and balance that as best as possible – especially right after a product releases. It’s why I specifically only release in-depth reviews on final hardware/software. Everything else gets a label of ‘Hands-on’ or ‘First Look’, usually with an additional note in the first couple paragraphs explicitly saying it’s not a review. But this is different. This is, after all, a final and finished product that you can buy today from various retailers. It is new, however. And therein appears to lie the challenge. But this challenge is somewhat compounded by circumstance. As it is, the company sent me this 50-pound trainer to test while I’m down in Australia, but I have zero desire to add that to my already extensive airline luggage bill when I head back next week. Unfortunately, at this point, it’s just not working yet, and they want to replace my unit to home back in Europe. Realistically, by the time they do that and troubleshoot issues, it’ll probably be late April. And y’all will be wondering what was up. So I’m writing what is effectively a placeholder review. It basically says ‘this unit doesn’t work well right now, but let’s see what it’s like by the time we get to summer (June/July/August)’. It also gives JetBlack a reason to try and improve some of the areas that don’t work or are missing. Which I think is good for the industry. Even though the trainer market is thriving with competition, more of it is better, especially in the $1,000+ game. So with that, let’s dive into what we’re talking about. It’s important to note that the WhisperDrive Smart is distinctly different from the WhisperDrive (sans-Smart). 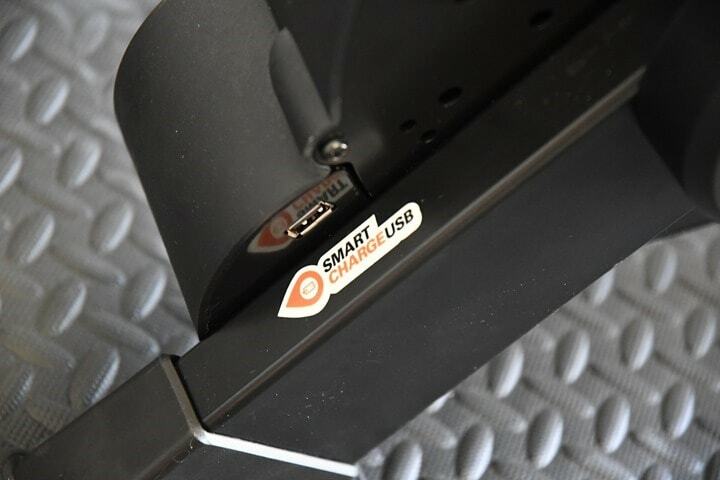 The ‘Smart’ part means that it’s controllable by an app – such as Zwift or TrainerRoad. That means the resistance changes dynamically to match terrain, or that of an ERG (structured) workout. If you tell the trainer to hold 275 watts, it’ll do so. Or if you tell it to simulate 8% grade, it’ll do so. When it comes to what’s in the box – things are nice and simple! 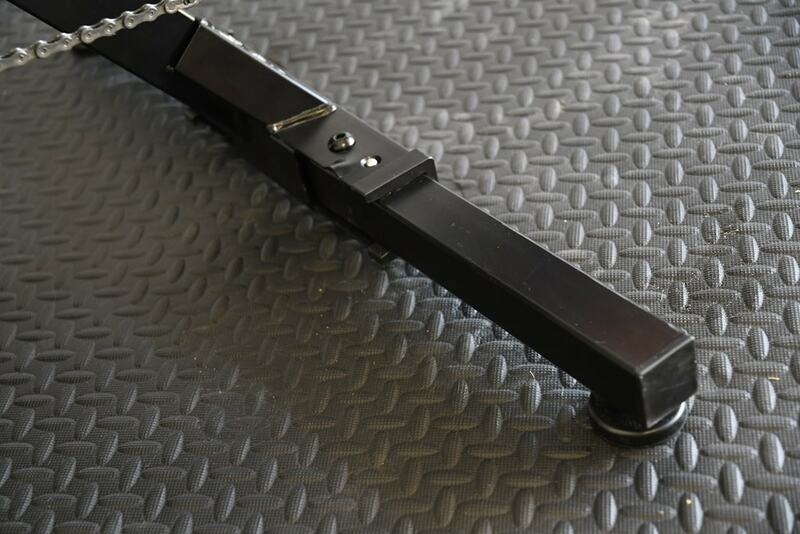 It merely has the trainer and two thru-axle adapters. No power cord is included (because it doesn’t even have a hole for it, it’s totally self-powered). 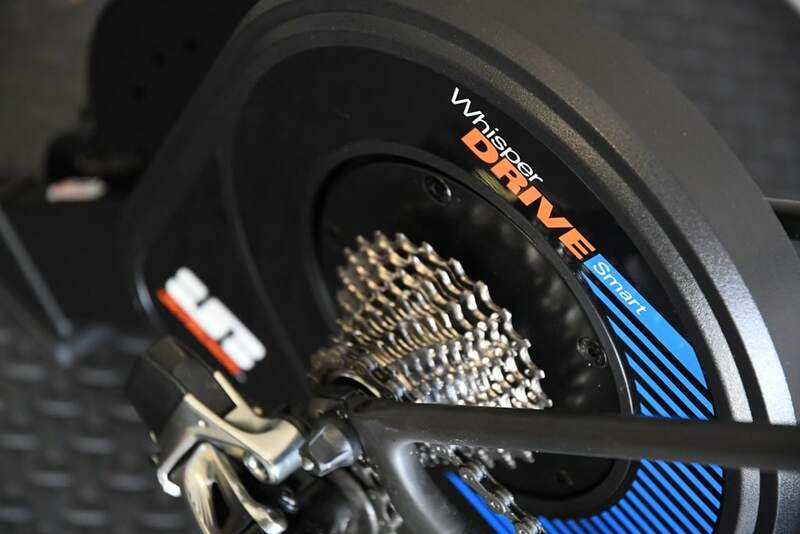 The WhisperDrive trainer is a wheel-off direct drive trainer, which means that you’ll remove your rear wheel to put it on the trainer, just like a KICKR or Tacx NEO or Elite Direto or CycleOps Hammer. Same-same. 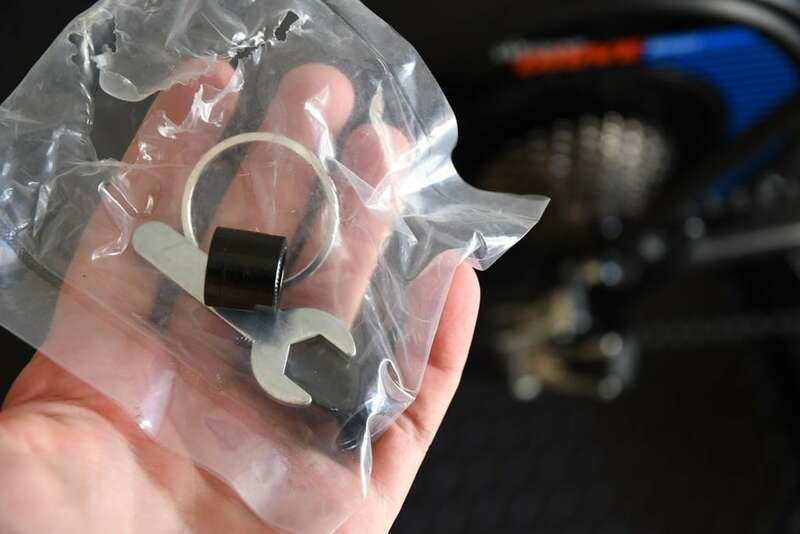 It also means you need to buy a cassette for the hub, since it doesn’t come with one (only Wahoo ships their direct drive trainers with cassettes). Roughly speaking, a cassette is about $60, plus $10-$15 in tools if you don’t already have them. The legs on the unit can fold in, to minimize the overall footprint. The unit isn’t necessarily the prettiest one out there in terms of style, but that’s OK, neither were many of Elite’s trainers, nor the CompuTrainer. Next, the unit supports thru-axle types of 9×130/125mm, 12x142mm, and a separate adapter you can buy for 148mm/BOOST compatibility. As well as standard quick release skewers for non-thru-axle setups. The spare parts were in one of the plastic bags seen in the unboxing setup. Then you’ll have noted there was no power cord. That’s because the unit is totally self-powered. Or rather, you-powered. As you pedal, it powers itself, similar to the Tacx Bushido trainer. The only downside here is that for pairing and such you’ll need to jump on the bike and pedal to make it show up in sensors menus. Also, that small LED light indicating status will illuminate once you start pedaling. However, perhaps the coolest part of the trainer is the USB port in the back. 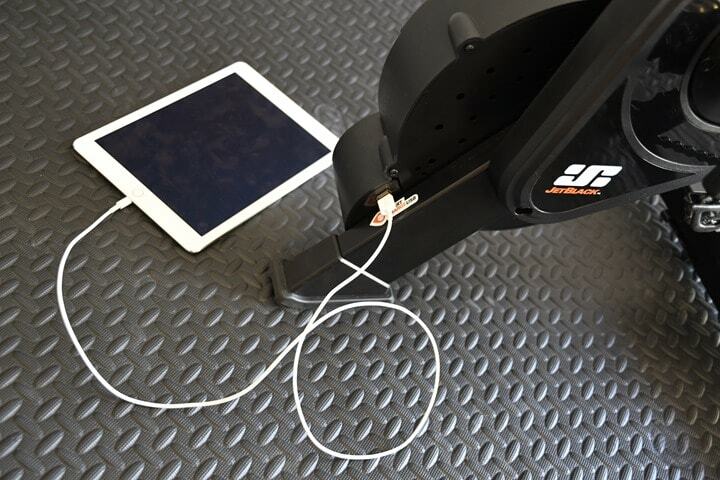 As you pedal the USB port will power/charge whatever you plug into it. For example – a phone. Of course, being where it is, the port isn’t exactly in the greatest spot on earth, but it’s handy nonetheless. If you had accessories like bike lights, you can leave a cable there and just charge them while they were still on the bike. In my case, I didn’t have a USB-C cable quite long enough to charge my rear Cycliq Fly6 CE light, otherwise it would have been perfect. But I did oddly enough charge a Di2 battery for another bike using it. I’m not exactly sure how much it charged it…but it’s the thought that counts. 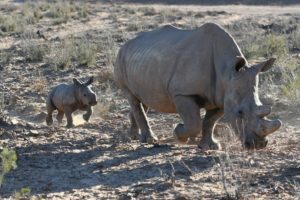 Next, before we talk pairing too much – what about noise levels? After all, the unit is named the WhisperDrive Smart. Thus, one might imply it’s quiet. But that’s definitely not the case. The noise coming off the unit is louder than a Wahoo KICKR 3 (2017), not massively so, but certainly not quieter. Here’s a really crude noise test I put together on the two of them. Note all the usual caveats in the video itself. And that’s it. It does NOT transmit as a normal Bluetooth or ANT+ power meter at this point. That matters if you typically record your rides on secondary devices, or with secondary apps. For example, I always record my Zwift rides on a Garmin bike computer. But I can’t do that now. That’s because while the Edge could connect via ANT+ FE-C, that would conflict with Zwift controlling it. Whereas typically I just pair the Edge to the power meter portion and it passively records. Similarly, if you’re one that uses second training apps in addition to Zwift, many will let Zwift connect to their trainer passively via just the standard power meter transmission. This allows them to use TrainerRoad or what-not for their actual workout, while gathering XP (Experience Points) on Zwift in the background. You can’t do that here. 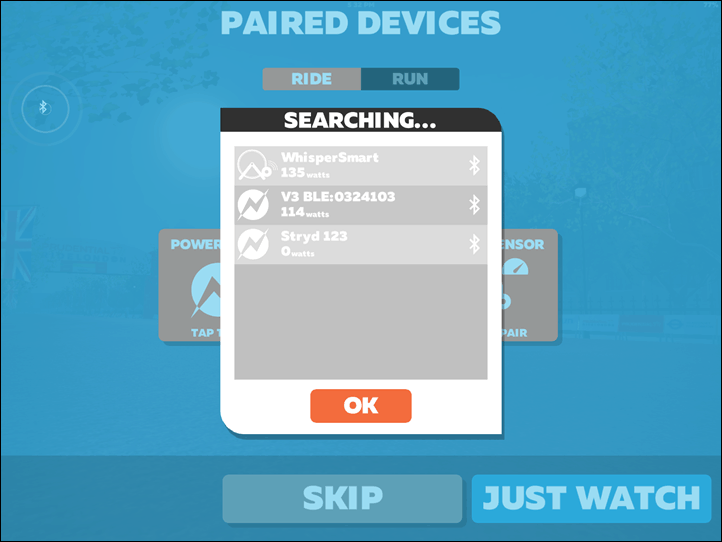 Inversely, I could pair it via Bluetooth Smart in Zwift, but then it stopped working after 2 minutes (every time). The company says they haven’t seen this though, and it may be something wrong with my unit. But then I tried to do a calibration of the unit (spindown/rolldown/etc…), and that failed. It actually disconnected the trainer. There was no calibration option for this trainer via Bluetooth Smart, and none via their app either. And as you’ll see – that’s kinda a problem. Sure, you can swap out Android in place of iOS, and Mac in place of PC – but that’s sidestepping the point. The point is validating that both Zwift and TrainerRoad work on both ANT+ & Bluetooth Smart. End of story. Plus, TrainerRoad is well known for helping companies navigate some of the trainer standard waters (and Zwift to a degree as well). After all, they want their platform to work on as many trainers as possible, assuming you color within the FTMS/FE-C lines. Beyond that though, many companies do actually also transmit other things. 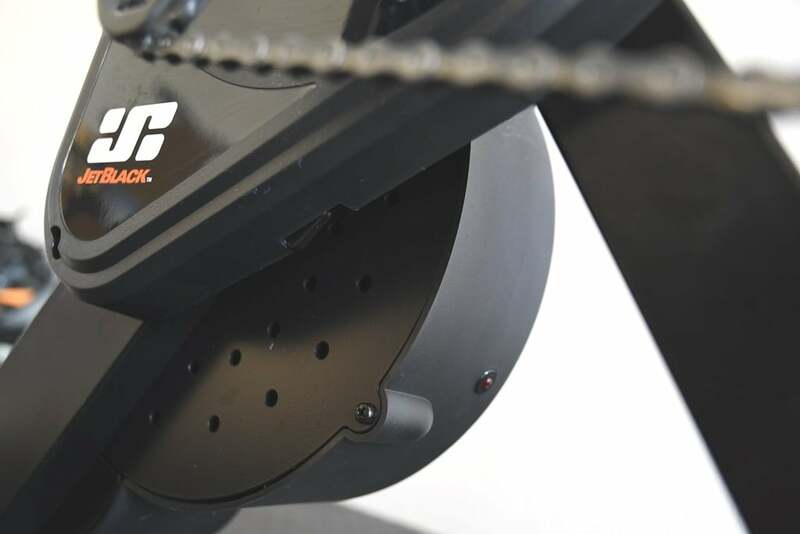 For example, Tacx transmits out each trainer as both ANT+ & Bluetooth Smart Speed and Cadence sensors, which is kinda nice for lesser capable bike computers. 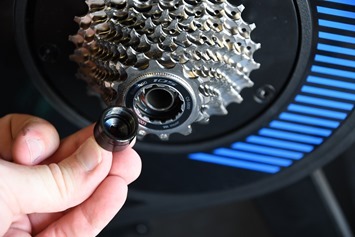 And some trainers also determine and broadcast cadence within the power meter transmission. Those are all nice to haves, but not required. Finally, things like protocols may be boring to talk about – but ultimately it’s actually almost all you care about. You just don’t know you care about it. Without these protocols your favorite apps won’t work with your trainer. 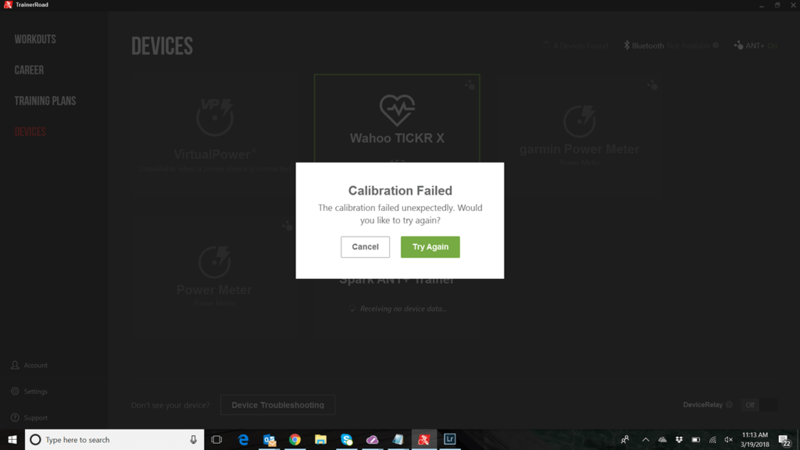 As was the case here, I couldn’t use TrainerRoad with my iPad, and on Zwift I couldn’t calibrate it either. 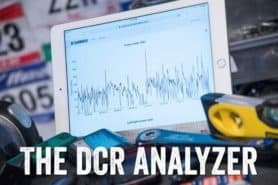 Typically I start this section by detailing quite a bit about how I do accuracy testing on trainers, varying the bikes and power meters involved, as well as the apps and control protocols. But in this case we’re just going to start. Not because those things don’t matter, but in the context of what I (and others) are seeing…well…they honestly don’t matter. A) It is unable to provide the proper resistance below ~200w: This is largely due to gearing, but on most trainers this isn’t really an issue until you get down to the 70-90w range (then gearing is more of a problem). B) The initial responsiveness is 3-7 seconds at start of an interval: This isn’t horrible, but it’s not awesome. It’s just ‘meh’. C) It can’t hold the interval wattage (period): You’ll notice it oscillates three times for each interval – spikes upwards of 620w and then down to 270w during the interval itself. It should be flat-lined at ~428w. Even at the end of the workout where it had a minute or so to stabilize, it’s still oscillating wildly. So basically, it’s not at all the structured workout I’ve laid out. 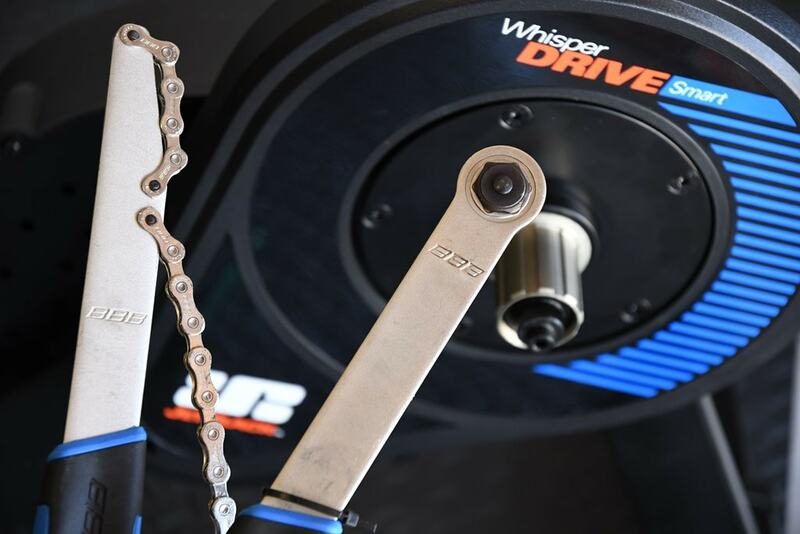 Now, less you think I or TrainerRoad are alone here, Shane Miller of GPLama found the exact same thing on ERG mode in Zwift too using the Whisper Drive Smart. You can actually find all my 30×30 tests over on my TrainerRoad here (the ones from ‘Ray’ are me), for those that are interested (all of them are labeled by trainer). Next, we went over to Zwift. On Zwift I added the trainer as FE-C and got cooking. This was immediately following the TrainerRoad test above (like, 5 minutes later immediately), so as such the trainer should be nice and warmed up, especially since I did a bunch of aimless testing before the TrainerRoad session. And thus, it’s immediately obvious. The JetBlack is drifting higher as the session goes on – upwards of about 50w. Whereas the Vector 3 pedals and Shimano crankset power meter are perfectly together the entire time. A) I almost took home a segment leaderboard: Except I didn’t, because I stopped pedaling at the top. That’s because my wattage was over 50w higher than reality…while not pedaling hard. So I slowed down to barely pedaling near the finish line, to not steal that away from someone that might have tried. B) I tried sprinting: But even in my biggest (hardest) gear combination, I quickly spun-out, which means I ran out of resistance during a short 13-second sprint – you see that around the 24 minute marker. C) I shouldn’t be able to do either A or B: I’m not a cycling powerhouse. I can’t hit above 1,000w unless assisted by a malfunctioning power meter. 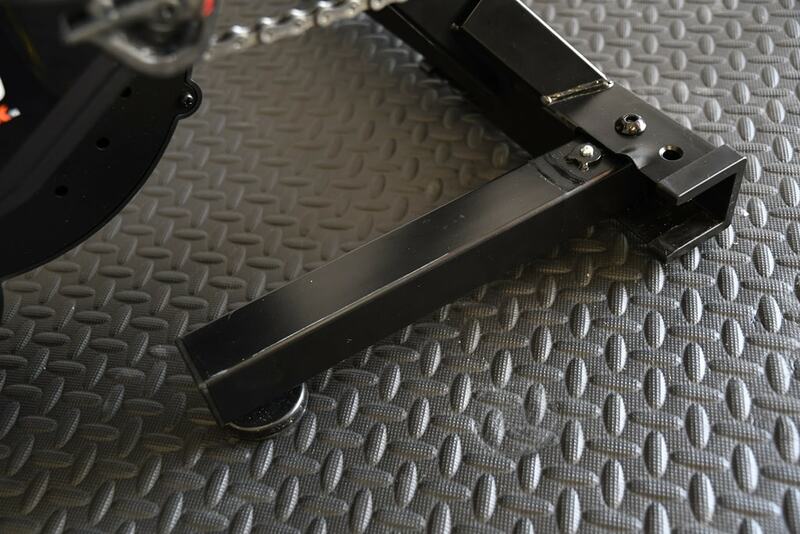 D) The trainer stopped responding to incline commands: After about 22-25 minutes, somewhere in there it stopped changing the grade of the trainer – so it just became flat. It was still transmitting power, even cadence (which is often wonky, btw), but was no longer matching the terrain I rode over. That’s why it looks so ‘level’ in those areas. And thus at 30 minutes I decided to end things. With the app no longer controlling my trainer in any meaningful way, and the trainer not accurate, there wasn’t much point to continuing. Plus, I was hungry for lunch. And again, remember this was with the latest firmware after the previous firmware I was testing had numerous power spike issues (allowing me to set personal records close to 2,000w). 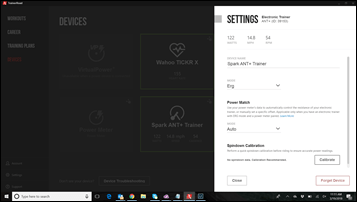 While this review is considered interim until they can sort things out, I did at least load the trainer into the product comparison tool for trainers. 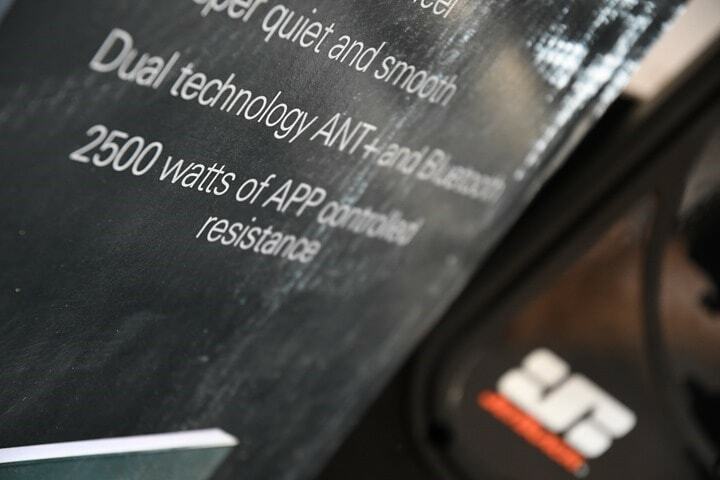 This allows you to see the full lineup of specs, and how it compares to other trainers on the market. For context, I went ahead and put in ones that I thought were roughly competitors. This meant the Wahoo KICKR, CycleOps Hammer, Tacx Flux, and the Elite Direto. 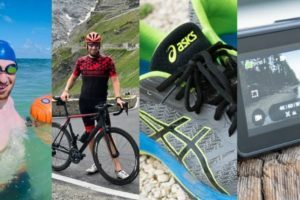 Note you can mix and match any trainers I’ve reviewed or ridden in the product comparison tool here. Again, remember you can mix and match any trainers I’ve ridden or reviewed in the product comparison tool. There’s tons of them in there. There’s no doubt the road for JetBlack has been long with the WhisperDrive. They showed it way back at Interbike 2016, and then it made appearances in 2017 at trade shows, and finally started shipping in early 2018. But at this point that road isn’t yet done being paved, despite the product being out in the wild. I found units in numerous local bike shops during my stay in Australia. I do think the company can likely address all of these issues with software updates, though I don’t think that’ll happen overnight (or next week). Realistically I suspect it’ll take until May or so to chug through these issues and protocol gaps. The pricing will also likely be a bit of a challenge going into the 2018 trainer season, especially when competing against both the Tacx Flux and Elite Direto which have higher accuracy claims. Though, both of those trainers require power and the JetBlack unit doesn’t need an outlet, which may be valuable for some folks. As I noted at the beginning – I’ll happily circle back to this unit once they believe these issues are addressed. They’ve offered to send out another one to try once that time occurs. I want to see as many competitors in the market as possible, especially ones from other continents that may make trainers more reasonable in certain geographies (read: Australia). Finally – speaking of trainers, remember that Eurobike is about 45 days earlier this year – now in early July. As such the entire ‘new trainer continuum’ has been moved up, at least for announcements. Virtually all announcements for trainers occur at Eurobike, or in the month or so leading up to it. This year won’t likely be any different. I would probably start the piece with something like “eventhough this is available on the market, it isn’t a finished product , and hence nothing that i would recommend to anyone.” Just my 5 cents! Seeing that oscillation brings me back to my college days. Whomever designed the control algorithm doesn’t know about PID controllers. They should hire someone that knows what they’re doing. guscrown, you are absolutely right that their controller settings are a problem, but it’s just as likely to be a sensing problem as a control problem. I’d actually wager that the PID coefficients are fine… If their sensor data were valid. The fact that the actual reported wattage is too high suggests that either their force transducer has problems (hardware fix) or their force-data clean-up processing is giving incorrect results (software). Good and fair review. Looking at your link to TrainerRoad, is there an explanation for the two Tacx Neo workouts being so off target? Basically, when you see that it’s because I started the workout and then immediately realized I didn’t have the power to complete it at the wattages I initially set. Most times I do these 30×30 test runs after a regular workout, since I usually want the trainer nice and warmed up. The challenge is if I had a hard workout right before it, then I often forget to adjust the percentage values before starting the TR session. So I have to do it right at the begining. Except when you do that, TR on their site doesn’t show the correct blue targets (but they do in the app). Kinda wish they’d fix that. Ray – why would you record your Zwift ride with your garmin device ? And not just let it synch at the end directly with Garmin connect? Would that actually keep your recovery time / activity load etc in synch on your 935 or on Garmin connect ? I still struggle with Garmin as to what synchs with what ! Correct. The on-watch recovery/etc time would be correct if you let it record on your Garmin. Versus uploaded data from Zwift by itself, wouldn’t do that. 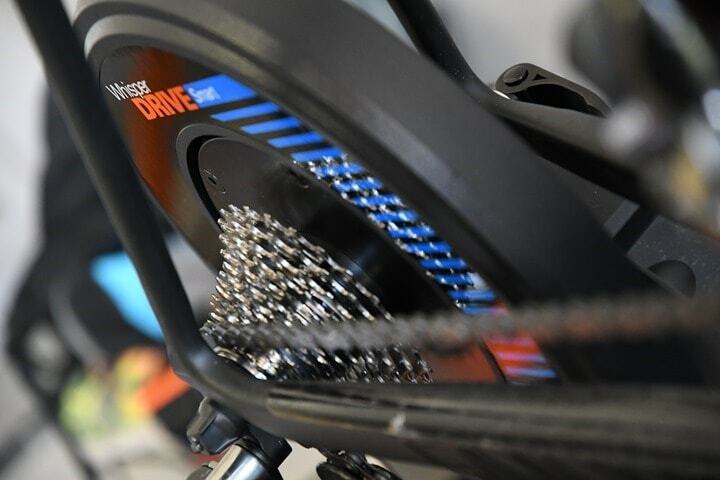 Right off the bat the WhisperDrive is a let down compared to the likes of Wahoo, Tacx or Elite smart trainers. Since most smart trainers are used indoors, I am not sure I see the value of the USB port. There are better options that don’t require hookup to the trainer. 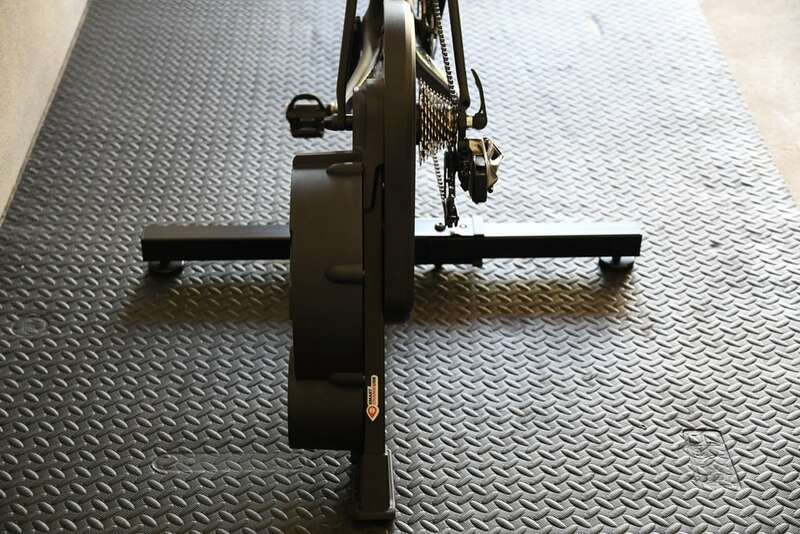 I suppose you could use it outdoors on a track or something, but realistically the reason why you have a smart trainer is to use it indoors when the weather isn’t optimal or to supplement your training when the weather is good. 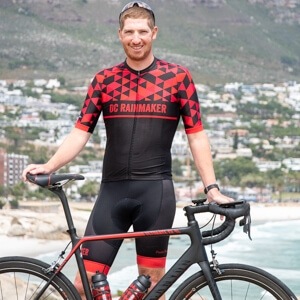 I am pretty sure Wahoo is going to release an update to their 2017 KICKR for 2018, which if what I hear is true, will be the trainer to own and put companies like Jetblack in the rear view mirror for quite some time. Unless you are warming up/cooling down for a race? The 2017 KICKR will still be an awesome trainer even if something else comes out this year. Maybe we will hear something by July when Eurobike kicks off. Looking forward to it. Unless they introduce a motor brake in order to allow accurate physics (esp. kinetic energy) modeling, rather than relying upon the compromised combination of eddy current brake + fixed mass flywheel, then your assertion is unlikely to be true. Given time, all the high-end trainers will end up using motor brakes. It’s been a real surprise to see so many manufacturers still pursuing the electromagnetic eddy current brake route, but I guess they’re all sticking to what they know for as long as they can before being forced to jump. 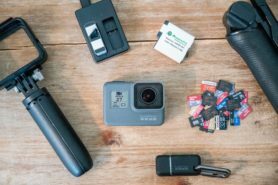 great review and hopefully some actionable feedback for the company. I’m hoping that you put the same feedback into KuaiFit who’s using your name to sell their product. They too have a shipping product and also need a fire lit under them to get it to something that people can actually use. And again, they are using your name and reputation to sell it. I think a lot of companies use random quotes that I’ve stated publicly in posts for various things. I generally don’t pay much attention to it unless it’s horribly misquotes. Obviously, I don’t get any money from those quotes. I was wanting to PURCHASE a replacement. Had zero response from them. Be interesting to see if they respond to any of this feedback! Another great review. I have to say I’m surprised that most companies don’t respond in the comments section of Ray’s reviews, especially the negative ones. Given how many people in the market follow DCR, it seems like PR 101 to say something generic like “We appreciate the feedback and are working around the clock to fix XYZ”, or if they legitamately disagree to explain why they think Ray is wrong (good luck with that). Any ideas why they won’t? Stubborness? Admitting a bug can be used against them elsewhere? JetBlack have done this on my video over on YouTube posted last week with similar tales as Ray has posted here. I suspect they’ll do the same here once they’ve read and digested the content. Most companies these days actually do post publicly in the comments section here on most reviews. 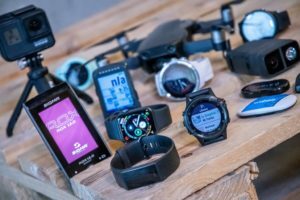 Even Garmin started doing it last fall for products announced/released since then. You’ll find a couple different Garmin folks ‘responsible’ for monitoring the comment threads here on posts like Vector 3 and the FR645, among others. I think the only major companies that don’t these days is Apple and GoPro. Suunto does sparingly, Polar with more focus on certain products. Wahoo quite proactively. All other power meter companies and trainer companies do as well. And almost every startup or smaller company does (I’d have to think hard to find examples of smaller companies that don’t). That said, even the companies that don’t post publicly do read. They often reach out if they see something odd in the comments and they want to get in touch with that reader. I’ll e-mail the reader first, asking permission to share contact info, and then connect the two once they agree. 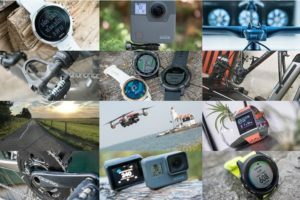 Garmin has long also read every comment on every one of their posts, especially after launch. They are definitely listening, as occasionally they’ll follow-up to ask how broad I might feel a given comment is (meaning, is it just a one-off, or a bigger item). Most brands do the same. And many companies (especially trainer and power meter) even have their customer service systems setup to actually issue tickets for every comment post made on their own product reviews. For example, if you post to a Tacx review, they’ve set it up to get e-mail notifications for new comments, which in turn create a helpdesk ticket ID that they track internally. Obviously, they don’t answer every one, but certainly they are watching. Ray, that’s an amazing post and explanation. Really think it needs a post of it’s own – like an FYI or such for people to refer to, maybe even for companies to submit their ‘helpdesk’ type support links and contacts for consumers requiring support. A ‘help’ page here for people to be directed to the correct place for support – obviously with reports back from those who’ve dealt with support. 🙂 That’s an acceptable reason, I know the feeling well. I have just switched from Wahoo 1st Gen to Neo based mainly on your comments and I am liking the quieter running. The most important takeaway here is to get off the trainer when lunch is ready. All trainers should support this protocol. I sometimes think you’re too kind Ray. I know you want companies to succeed, but as a consumer I want to be able to come here and read of the products I should avoid, as well as those which are good. If a company is selling a device which is bad — do not feel you have to give the company time to fix things. It was their choice to launch too soon. Instead tell us that a device is shoddy so we can avoid wasting money. I kind of agree. Except for the pre- and post-race use case (where not needing power is a plus), I don’t see how even if all their problems are fixed that this trainer is competitive based on noise, accuracy and price. Why would anyone buy it? I suspect in some ways I’m damned if I do, and damned if I don’t. If I had simply posted a paragraph or two that basically said ‘this trainer doesn’t do what it says it does, and then some’, then people would say I was favoring Tacx/Wahoo/Elite/CycleOps and not giving newcomers a chance. They’d say it deserves a full review. B) The Basics section notes how it fails to do the most basic protocol things correctly. E) The Summary says straight up don’t buy it. I’m unclear on how I’m favoring them? I am not sure what review some others read….for me the review screamed ‘don’t even think about buying this crap’ and based on your previous reviews of trainers I don’t see how you are favoring one brand over another. I just don’t get that from any of your posts I have been reading over the past 2-3 years. That is a mighty expensive trainer for the many defects. Hope no one buys that until they get stuff fixed up. It would be a shame if people had bad Zwift experiences and quit the app, because the trainer was making their experience bad. Correct, same issue I had as noted above. It’s because the JetBlack trainer isn’t properly broadcasting as FTMS, but rather…something else. They’ll need to work to properly implement FTMS (the equivalent of ANT+ FE-C, but on Bluetooth). TrainerRoad is really good about helping companies implement it though. FTMS once implemented properly has the benefit of making your trainer compatible with almost all other apps too. Tony from JetBlack here. We have taken the recent feedback and comments onboard and have had our development team working day and night. We are releasing a firmware update today that addresses the behavior observed in ERG mode as well as updating the Ant+ naming. We are well underway with Bluetooth FTMS coding and Spin Down Calibration implementation which will optimize user experience across apps and devices. We are expecting both these items to be complete within the next 4 weeks. Once complete they will be available via a firmware and app upgrade. Users can be confident that we are working overtime and upcoming updates will have these issues sorted. Thanks again for your feedback and I will keep you posted. – Excitedly rush home with new trainer and set it all up! – Start pedalling to turn it on, connect to phone with the Jetblack App and update the firmware. 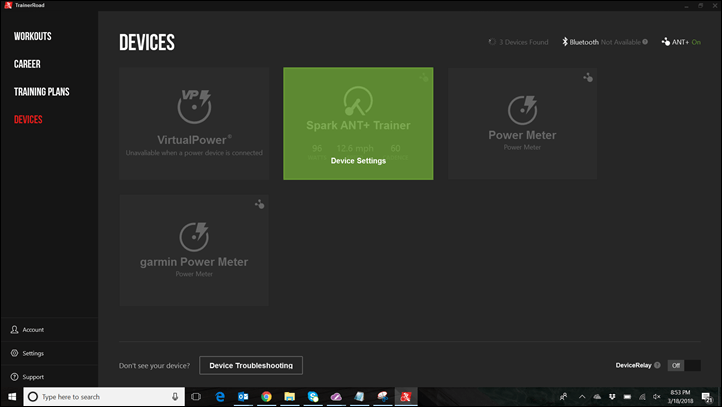 – Connect to computer via Ant+ in Trainerroad, where it works for a little bit but keeps dropping out. – Connect to Phone via bluetooth in Trainerroad. It sees the trainer but can’t connect. – Connect to Tablet via Ant+ but it keeps dropping out. 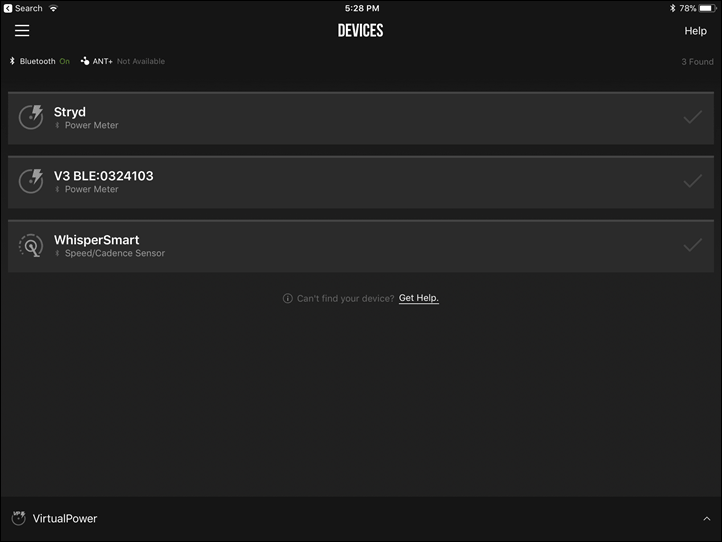 Try bluetooth on same tablet, sees it but can’t connect. – Same problem with a different laptop and an iPad. Sees the device via bluetooth but can’t connect or drops out with Ant+. – Got hungry so went and had dinner. – After dinner nothing can see the trainer, not by bluetooth, not by Ant+. Not in Trainerroad or the Jetblack App. Nothing can find it. – Send email to Jetblack and the company I purchased it from. Company I purchased from helped with a few troubleshooting issues (pedal for 30 minutes to charge up, open it up to make sure battery is connected) but it didn’t work. A quick update from JetBlack. Our development team is working hard to resolve Ray’s highlighted issues. We are happy to say, we have just release version 41, fixing and stabilising the trainer while using ERG MODE. The developers are now into the 6th day of a 10 day Bluetooth FTMS build. This will help connect our trainer seamlessly to popular 3rd party platforms that have had trouble implementing JetBlack’s Bluetooth code. Expect an update out shortly for this. I took a leap of faith and bought a unit a couple of weeks ago. The shop offered to take it back no questions asked if I had problems with it. I uploaded the firmware upgrade 4.1 and have had absolutely no troubles in ERG mode so far. The unit noise is ok, way louder than my Tacx Neo but at the price point very acceptable. Easy to connect to the PC and Mac via Ant+. Not tried Bluetooth yet. Thumbs up from me. PS. 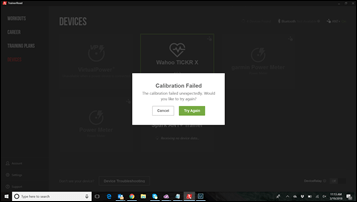 can’t see any option to calibrate. I’m not sure if it’s like the Neo which does not need manual calibration but it would be reassuring if the manual said one way or the other. Hi Chaz, firstly thank you for the “leap of faith.” You aren’t alone, many other users are having great experiences on our Trainer. Our development team have now finished updating the Bluetooth code to comply with the popular training platforms. We are now just waiting for them to test and confirm the build. This will give you a great experience on Bluetooth, similar to that on ANT+. 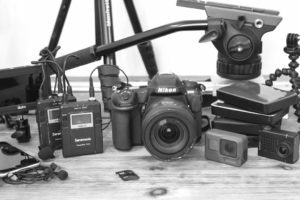 where do we check for new firmware update releases? Hi Charlie, Normally you would receive an email informing you of updates if you have registered within the App. Before connecting to the Trainer, Please go to SETTINGS > UPDATE FIRMWARE > FIND (this will connect your trainer) the app will then inform you of any updates or tell you your trainer is up to date. Murray, maybe I am blind but can’t seem to find anywhere in the app that shows what firmware I have ?? Is it still sitting on the 4/08 firmware? any update on the timing / content of the next update? Hi everyone I’m Taiwan user and bought it on January this year. the trainer can respond your resistance within second in ERG mode. I can use TrainerRoad in smartphone by this trainer,that’s great!! I dont think mechanical problem could be solve by any means. Hi Herman. Thank you for your patience and kind words. We work very hard to get this right. Our response time will always be slower due to the amount of power being used from the self generating system. I kind of like the delay going into the hills. Gives me time to adjust my gears. You will find after a few spindown calibration your 20 watt cap will close. 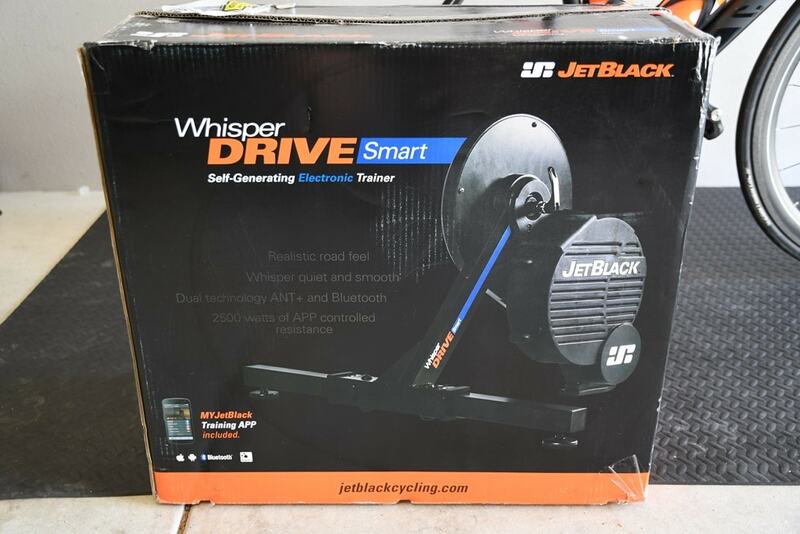 JetBlack are pleased to annoyance our development team have successfully implemented and updated the WHISPER DRIVE SMART’S firmware and features to meet the Industry standards. By doing this JetBlack is one of the few, leading the way in trainer software and hardware communications. With this update, it has given us the tools to improve other areas highlighted in initial reviews. Such as, Stabilizing ERG mode, Accuracy in readings and the ability to connect with everyone over the few chosen. This new build is exciting for the future models we have in development and has given us a futuristic leeway in trainer technology. We are confident with this build our customers and future customers will enjoy a problematic free experience with the Whisper Drive Smart. o	NOTE, Cadence will no longer be advertised as a feature but will remain working as an estimated reading with limitations. Limitations to a user doing very fast changing intervals. i.e. 10 sec sprints with very short recovery. We have refined cadence and it is working perfectly within simulation on Zwift and other platforms. The only barrier we are left with is our reaction time. Moving the resistance unit from 0 to 7% for example, will take our trainer 5 to 7 secs. This is due to the power supply not being enough to quickly move the motor. One small sacrifice to pay for being self-generating! Also note, Zwift and Rouvy are still to implement the FTMS protocol so we recommend using ANT+ when connecting the WhisperDrive Smart with these two platforms. All other platforms including our App have updated to FTMS. We are working closely with these two platforms to finalise the build . In the coming days the development team will finalise the ability to board cast ANT+ and BLE power, Speed and Cadence. We thank you for your patients and comments (good and bad) as like in training, it’s all about preparation. Hi Chaz, Our App development team are running behind. All going well we will have the App update out within the next week. Until then you could use the Trainer road spin down if you have an account. You will receive an email informing you of the App release. The update is great. 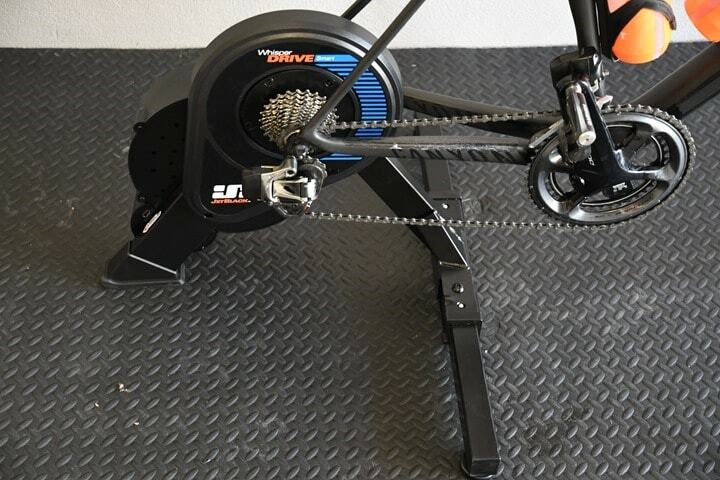 Erg mode and the spin down work well in TrainerRoad. 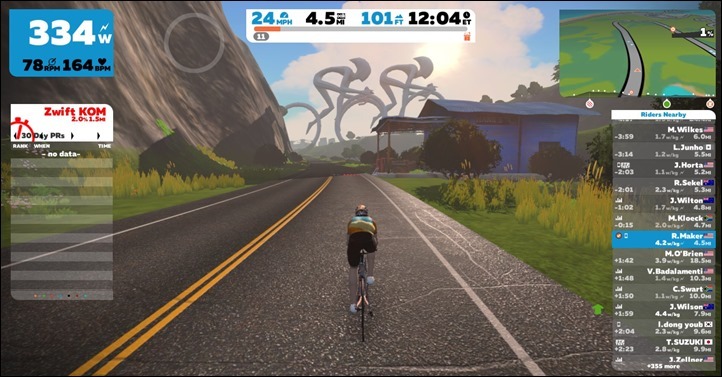 BT works well with Zwift on Apple TV, but there doesn’t seem to be enough resistance. Almost like flat ground is -1% or something. I spin out below 300 watts. It works great up the virtual hills. Any ideas? It’s really hard to tell on TrainerRoad since there isn’t slope mode. In erg mode, I do seem to be in a larger gear than I would be in other smart trainers. I really can’t do hard efforts in the small ring like I’ve done in the past (high load / low inertia). It works well, but I’m in a larger (and thus noisier) gear. On the spin-down I’m also in a larger gear than I’ve needed on the Magnus, or Flux, or Neo I’ve used in the past. Zwift is interesting. There doesn’t seem to be a resistance change between like -3% to 2%. The resistance is fine descending actually. But on a flat road I’m nearly spinning out if I go hard at all. I’d never be able to race in simulation mode but for riding around it’s fine. Up to about 5% it feels to easier than it should be, above that the resistance really kicks in and it feels really good and accurate. Again, it feels great – just not accurate to the virtual world. I like forward to the update. We have had some great response regarding the firmware update but have noted a couple of units not calibrating to expected values. We want to make this right for you but i need some tech info for this to happen. Sorry this has happened to you and anyone else but it is a easy fix with the correct info. Hopefully hear form you shortly. Thanks for the feedback. This will help us refine the areas you noted. We are also looking forward to this update and will come back to you very shortly with the update. 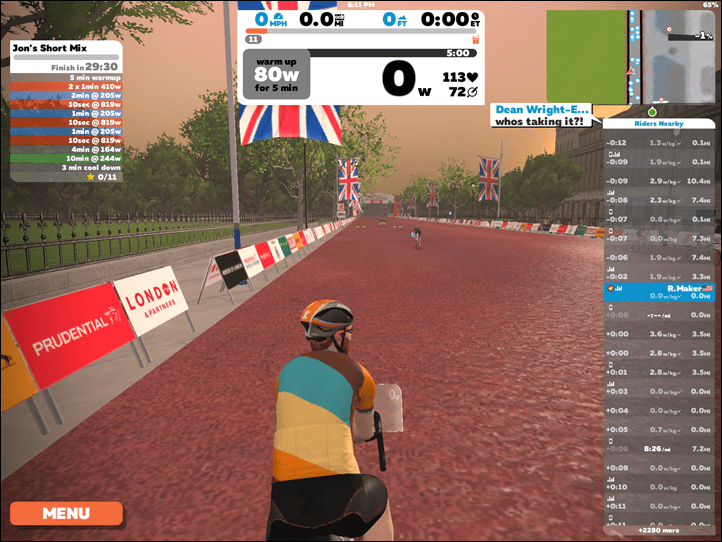 Erg mode in Zwift doesn’t work acceptably either. Hardware is nice, software wise it’s worse than the vortex I had 2 years ago. TrainerRoad works in erg mode as long as you don’t try to do a workout with big changes, then you have to shift. I’m close to going back to my Magnus and tossing this in the closet. It’s a shame, hardware feels great. Thanks for your email and feedback. Can you let me know what version firmware you are running please. Update on our latest firmware released last week. 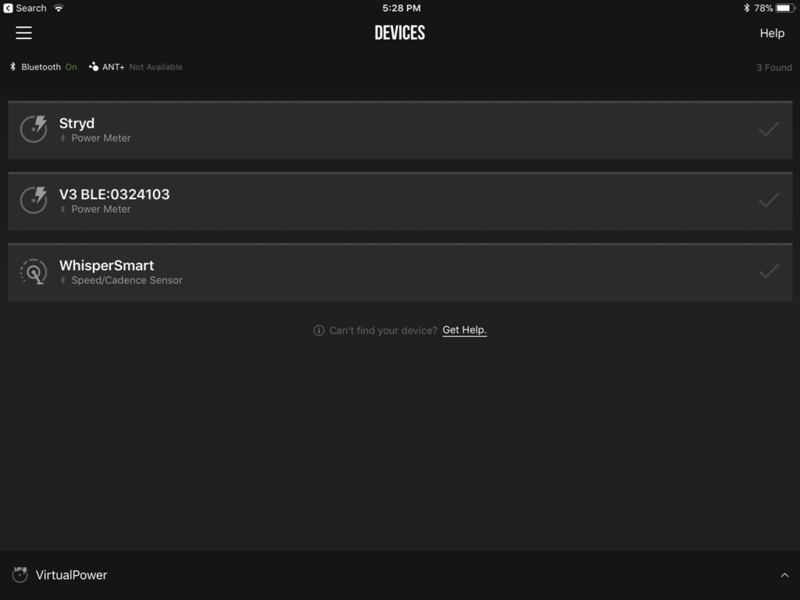 Did a quick test on the new WhisperDrive Smarts coming of the production line. Updated with our latest firmware available to all 0.44. Using Quarq Cranks and Assioma Pedals to check Power and Cadence while riding the new course on Zwift. Loaded onto the DC Analyser to compare. Sweet calibration, sweet cadence. We are still waiting on Zwift to update their IOS Bluetooth FTMS service. This will give users using Bluetooth FTMS, more realistic resistance. Zwift tell us they will push it out this week. Hi, have you done a more up to date review of this since the firmware updates have been introduced? Hi Emma. DC has our trainer now. Last message from him, he was doing an update for his famous buyers guide due out very shortly. You should see this in the next couple of weeks. Saying that we have had great feedback from customers about our firmware updates. Everything is working sweetly. Happy training. Murray. I can confirm with the latest firmware I’ve had good sessions on TrainerRoad with the power tracking very closely to the target (almost always within 2% unless I get slack with cadence control). Just have to spin amd warm up for 10-15mins before connecting to charge the battery to make sure stable wireless connection. Cheers Lom, for your Feed back. Maintaining a strong battery helps with the quality of connection. The reason for this, while using ERG or Simulation (Zwift) uses massive amounts of energy. The motor is constantly searching and moving, in some cases drawing energy from our connection battery. We suggest placing the trainer into a constant resistance mode once per week and riding for 15 to 20 mins. This will help regenerate the battery. Use this time to warm up or down. Has a new review been done on this trainer? – I think it was mentioned at the back end of last year…. I’m about to push the button on one but not sure if it still has issues…. Not yet. I do have a new unit though, it’s in the to-do queue. Larma did a re review on our trainer last year. Also Triathlete.com review as well. We are getting great reviews and traction in the Market with Version 2. But what do you mean by version 2 – is this software or hardware? An update to the review… bought the trainer for zwifting and now can’t get through a 60min ride without the battery completely draining and leaving me with a 120 cadence for 80 watts. I’ve done all the recharging methods and yesterday left my trainer with 21% battery lift only to get on for a Zwift ride now and have NO battery power! I’ve had to connect my vector pedals to at least get some riding done. Disappointed. Angry. Frustrated. No money to buy something else. How do you know what battery level the trainer has? Just to say I’ve had mine two weeks- used three times – no issues, Wakes up after two to three pedal strokes…. however I’ve not done longer than about 90mins… It shouldn’t be using battery whilst you are riding anyway? On the jetblack app, sensors shows the battery level. 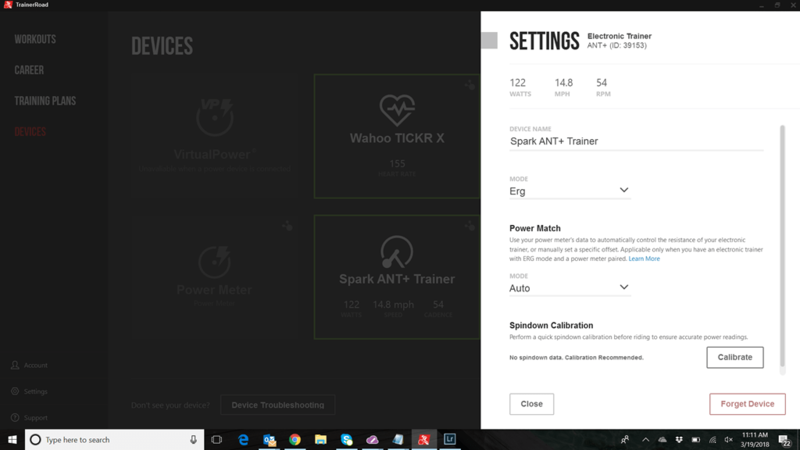 I connect with ANT+ from trainer to Macbook and if I run ERG mode or ride a hilly course on Zwift, I can’t get to 60mins with all resistance disappearing and then next to go is the actual watt reading. It even gave up on me within sight of the arch on Alpe D Zwift. I had to cancel ride not finishing the climb. I feel your frustration and anger. Sorry about this happening too you. If your battery is running low your trainer is faulty. This issue has been resolved and we will need to get you a new unit out asap. You can keep an eye on your battery status when you first connect to our App it will show the %. If by chance your battery is dropping, simply place the trainer into a set resistance mode on the app and ride for 30 to 60 mins. This will boost the life. As I said to David, the battery issue has been resolved but some older models form early productions will be affected.